The Compressor section of the 286s changes its gain in response to the signal at its input. Many compressors have a user-selectable level, called THRESHOLD, to help determine when compression occurs. If the input signal is low in level (below the threshold of compression) the compressor gain remains fixed. If the input increases above the threshold of compression, the gain begins to decrease (i.e., the amount of gain reduction increases). For very large input signals, the gain can decrease considerably. On the 286s, compression occurs as an input level is “driven” into gain reduction by the 286s's DRIVE control; as the DRIVE setting (adjusted clockwise from OFF) increases input gain, the amount of gain reduction also increases. The 286s does not have a Threshold control; the threshold is established by the setting of the DRIVE control. The De-esser section of the 286s reduces the high frequency energy present in certain vocalizations, of which the most common is sibilance. Sibilance is the hissing or rushing sound produced by blowing air through a constricted (narrow) mouth opening or across the edge of the teeth, as in the “s” and “sh” in “sash.” Sibilants contain predominantly high frequency components with a sharp rise above 1kHz and most of the energy in the 4kHz to 10kHz band, centered on 6kHz to 8kHz. The dbx286s's Enhancer adds detail by enhancing the low and high frequency content of the signal. The Low Frequency enhancement simultaneously applies an 80Hz boost and 250Hz cut to the signal. This lets you apply substantial bass boost without making the material sound muddy or boomy due to excessive mid-bass boost. The High Frequency enhancement is a form of dynamic phase and amplitude equalization. Continuous analysis of the input signal intelligently and automatically determines the amount of equalization necessary at each moment to achieve detailed, defined audio that is never shrill or over-sibilant. External audio processors (e.g., equalizer, delay unit, etc. ), can be placed in the signal chain directly between the Mic Preamp Section and remaining 286s processing via the rear panel INSERT jack. Easily determine the processing status of the 286s via the front panel LEDs. The 286s can supply +48VDC phantom power to your condenser microphones. This industry-standard configuration supports virtually all currently-manufactured phantom power mics. 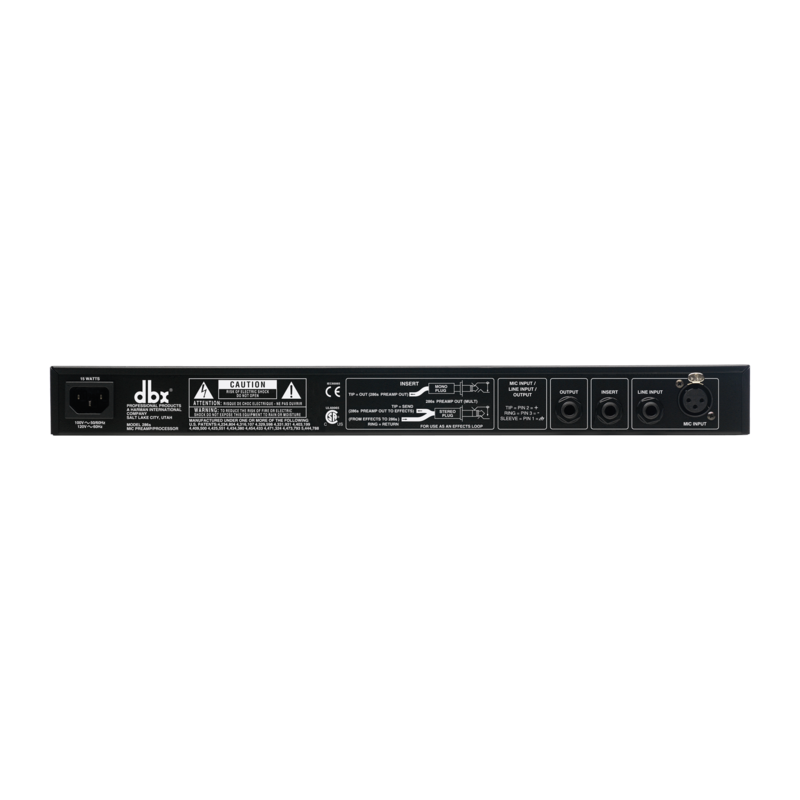 The dbx® 286s is a full featured Channel Strip Processor that delivers a studio quality microphone/instrument preamplifier and four processors that can be used independently or in any combination. Why mic up vocals and instruments through a noisy, blurry mixer? The sonically pristine dbx 286s Mic Preamp has all the features you need, including wide-ranging input gain control, switchable +48V phantom power, and an 80Hz high-pass filter to remove low frequency hum, rumble or wind. Use the patented dbx OverEasy® compressor to transparently smooth out uneven acoustic tracks or deliver that classic "in your face" vocal performance that only a dbx compressor can. Eliminate vocal sibilance and high frequency distortion from instruments such as cymbals with the frequency tunable De-Esser. Fine-tune the Enhancer HF Detail control to add sparkle and crispness to your tracks and make adjustments to the LF Detail control to add fullness and depth to vocals and bass instruments while cleaning up the muddy low midrange frequencies. And, the separate threshold and ratio controls on the Expander/Gate allow you to subtly reduce headphone leakage or radically gate noisy guitar amps. The dbx 286s offers a full compliment of metering and status LEDs to visually guide you to achieving the right sound. The floating balanced XLR Mic Input accepts balanced or unbalanced inputs to easily connect to professional and home studio microphones. The additional 1/4" TRS Line Input can accept balanced/unbalanced signals to process live electronic instruments or pre-recorded tracks at mixdown. Use the Insert jack to interface between the Mic Preamp and the signal processing sections to "loop out" to external processors (such as EQ or delay unit) or to mix the Mic Preamp's signal out to an external destination. The cost and hassle of patching together multiple processors for use on one track can be frustrating. The dbx 286s provides you with all the mic processing you need in one box, with the shortest, cleanest signal path to keep your music sounding its best!